Japanese exports continued their decline in March, falling almost 7%, as the global trade slump continues to exert deflationary pressures worldwide. Overseas demand for Japanese steel and metal working machinery sank and with the yen so strong manufacturers are struggling to stimulate export growth. 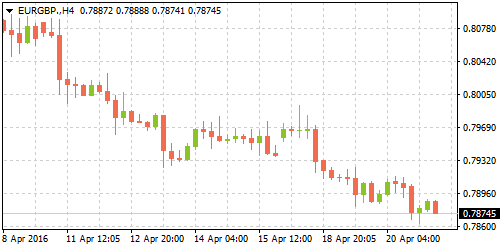 On a month over month basis, Germany's PPI was flat in March, following February's 0.50% declines, according to data released yesterday (Wednesday) by the German statistics agency Destats. 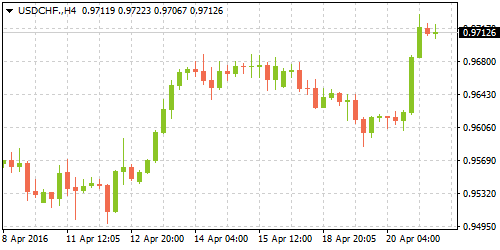 However, compared to a year ago, the German PPI fell 3.10% in March, accelerating from February's declines of 3.0% year over year declines and missing forecasts of a dip of 2.90%. The 3% year over year decline was the sharpest since January 2010 when the PPI fell 3.50%. Stripping out energy prices, Germany's PPI fell only 0.90% compared to a year ago. Intermediate goods fell 2.30% and non-durable consumer goods were down 0.30%. On the other hand, capital goods increased 0.60% and durable goods gained 1.40%. The German PPI has been steadily declining since August of 2013. Japan's exports declined 6.80% in March on a year over year basis, falling for the sixth consecutive month and extending one of the longest streaks of declines since 2012. Merchandise exports fell 6.80% to 6.547 trillion yen in March, following a 4.0% decline in February, according to data from the Ministry of Finance released on Wednesday. The 6.80% decline was however better than analysts’ expectations who forecasted a 7.80% decline. Imports slumped sharply, dropping 14.90% in March to 5.702 trillion yen, posting the 15th month of consecutive declines. Taken together, the import and export data showed a trade surplus of 755 billion yen in March compared to 222.7 billion yen a year ago. Sales of previously owned homes in the US increased 5.10% in March, to a seasonally adjusted annual rate of 5.33 million units, data from the National Association of Realtors showed on Wednesday. The 5.10% increase beat analyst expectations of 4.30% or about 5.30 million. February's data was revised lower to 5.07 million from the initial estimates of 5.08 million. Compared to a year ago, existing home sales increased 1.50%. The existing home sales data offered a glimmer of hope after Tuesday's housing starts and building permits which both fell sharply. Following the release, the US dollar managed to close stronger, recovering from the losses incurred earlier in the week. The European Central Bank convenes for its monetary policy review meeting today at 12:30 GMT at the ECB headquarters in Frankfurt. Analysts expect no major changes to monetary policy with the ECB's minimum bid rate currently at zero percent and the main deposit rate at -0.40%. 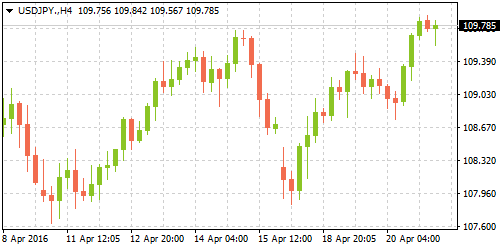 This non-event in policy changes will shift the market’s focus on the ECB’s press conference which follows 45 minutes after the minimum bid rate is announced. Draghi is expected to express a dovish stance and perhaps make use of a more conservative tone considering that the euro surged last month in March despite the ECB cutting rates broadly and expanding its QE program. 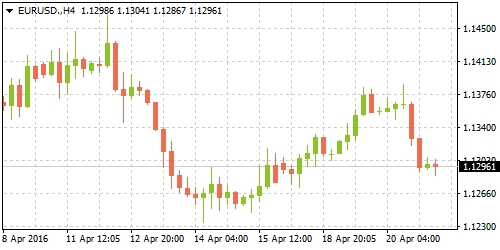 In anticipation, EURUSD closed yesterday at $1.1295 falling sharply from a 4-day high at $1.1387.